Sylvia Katherine Benda was born March 3, 1927 on the family farm near Banner, OK. Sylvia was the youngest of seven children born to Frank & Rosa Zoubek who were Czech immigrants. Sylvia graduated from Union City High School in 1944. On November 14, 1948, she married the love of her life, Jerry Benda, at the Yukon Czech Hall. Sylvia began her life with Jerry first as a farmer’s wife & best friend, then mother, grandmother and great-grandmother. She is a member of the American Legion Auxilary for many years, as well as, served on the Election Board for over 35yrs. She was a member of the Lodge W.F.L.A. Jan Ziska, Lodge 67 of Yukon, OK. Sylvia is preceded in death by her parents, 3 brothers, 3 sisters, her husband, Jerry Benda and grandson, Sammy Jay Novosad. She is survived by 4 children: Nancy Novosad & husband Sam; son, Gary Benda & wife Dianne; daughter, Colleen Carlisle; son Paul Benda & wife Bekki. She is survived by her grandchildren: Chris Novosad & wife Maryorys, Gena Novosad, David Novosad & wife Chloe, Alan Benda, Ashleigh Petrides & Jessica Streller & husband Eric. She is also survived by 4 great-grandchildren. Graveside rights will be at the Czech National Cemetery on April 3, 2019 at 2:00pm, under the direction of McNeil’s Funeral Service, Mustang, OK. 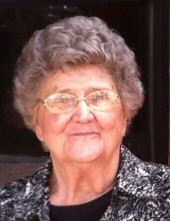 In lieu of flowers, her family requests that donations be made to the Czech National Cemetery. To send flowers or a remembrance gift to the family of Sylvia Katherine Benda, please visit our Tribute Store. "Email Address" would like to share the life celebration of Sylvia Katherine Benda. Click on the "link" to go to share a favorite memory or leave a condolence message for the family.